Discussion in 'Basses [BG]' started by Mastesbasser, Jun 4, 2002. 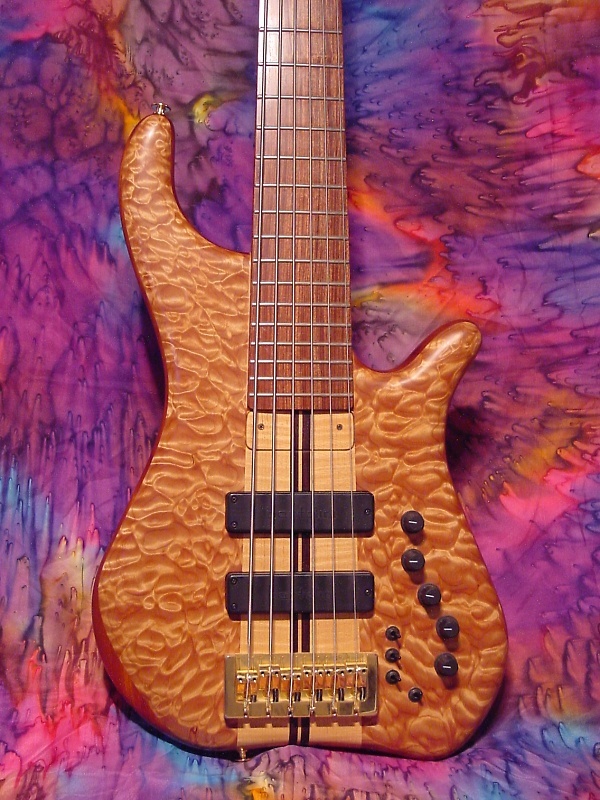 I'm curious...your Hanewinckle is beautiful, and I know the tones you downloaded a few months ago were incredible...what woods is your bass made from? Thanks . The body is padauk with a macassar ebony top. The neck is bubinga and wenge. The light pinstripes are all pau amarello. I haven't put it on a scale yet, but it makes for a fairly heavy combination. I also remember the beautiful tones that came out of that bass. Are those custom made basses? I never really heard of them before. Great bass for under $600. Comes stock with active bartolini pickups. copy and past the url. Nice, what is that third bass? I dig it, they have a website??? hey, geshel. Hows the new hanewinckel comin along? I think it loos great! I love those basses. Any progress being made? It's a Galveston 12-string. Made in Korea. Used to be a million of them on E-Bay cheap. It would be a lot cooler if it didn't have crazy neck-dive. I can't stand playing it anymore. ChrisJ, I got word from Pete that the fretless was nearing completion! Should be done in a week or so, then it'll ship. Can hardly wait! oh, darn- here we go again..
the Roscoe.. and the MTD 635..
Dan's bass- i had the sister bass here for a minute- Bebensee makes a hell of a bass- Hey, Dan- you still got that thing? WOW! Dan, mind if I ask how much that thing priced out, with all of the options? That is schaweet!!! Thank you. Ken did a knock-out job on that bass. He puts the same amount of care into every instrument he builds. That's why it took 17 months to complete. NO SHORTCUTS! By the way, the bass has a 1200 gritt, hand polish. It took him almost a week to do the sanding/oil finish. $4500.00 was the price last year. It may have changed. No Adrian, I no longer have that bass. Don't ask me why 'cause I don't know either. Jeepers I can't get enough of that bass, Dan. I can't believe that maple burl top. It's beautiful under every angle. I think a 36" sixer might be a tad much for me and my scrawny wrists though .